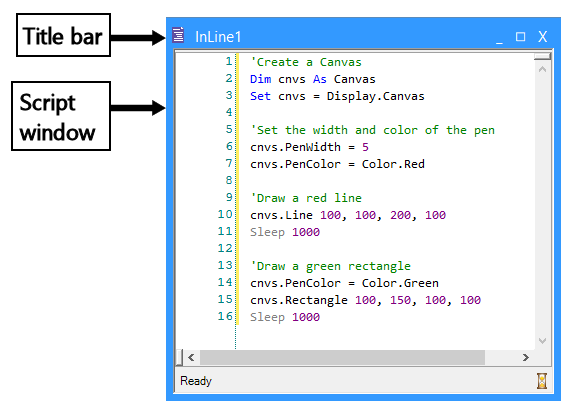 The InLine object as it appears in the Toolbox. The InLine title bar appears at the top of the object window when opened in the Workspace. The title bar displays the InLine object icon, as well as the name of the InLine object. The script window appears below the title bar, and displays any user-written script. User-written script is entered using E-Basic, the complete scripting language underlying E-Prime. Script entered into an InLine object is inserted “as-is” into the experiment script at run-time. The location of the script in the generated experiment specification file (*.es3 file) is relative to the location of the InLine object within the experiment Procedures. Script may be entered in the window by placing the cursor in the window and typing directly in the window. Alternatively, script may be entered via the Script field in the Properties window. The latter method is not recommended, as it allows the user to view only a small portion of the script at one time. E-Basic provides syntax highlighting to aid in the readability of script. The InLine object is not a “runnable” object. Rather, the script contained within the object is inserted into the experiment script, as is. The Properties of the InLine object may be set using the fields in the Properties window. (Name) String values Assigns a user-entered string as the name of the InLine object. (About) ---------- Displays the About InLine dialog. (Property Pages) ---------- Opens the InLine object window. Code E-Basic Script User written E-Basic code which is inserted directly into the program script. Tag String values, Attribute references User-defined string to be logged with the object.